Japanese food is definitely one of my favourite cuisines to eat. I am definitely guilty of getting cravings for wagamamas. Most high streets have at least one place where you can get sushi, even if it’s just your local boots meal deal or supermarket. Although they definitely don’t taste as nice as the real thing. In Brighton we are very lucky as there are quite a few sushi restaurants to visit, both for a quick-lunch or evening meal. Clem is also a fan so I thought we would have a go at making our own for lunch. I was actually surprised at how well they turned out. I got most of the ingredients from a local asian supermarket but you can find them in most major supermarkets as well. You can also buy kits which contain everything you need, apart from the fresh ingredients. 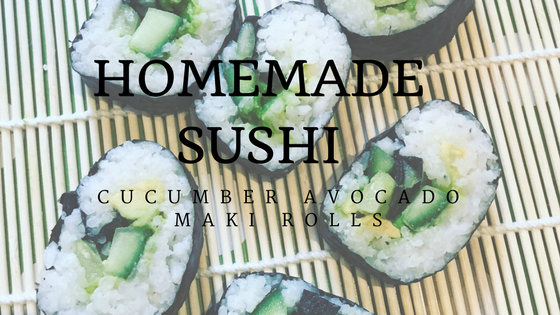 We decided to make cucumber and avocado maki rolls as both of those are Clems favourites. Pinterest is also full of great ideas of what to put in them if you get stuck. Rinse the rice very well under cold water. Drain thoroughly and put into a large saucepan that has a lid. Pour over 1 pint of water and add a little salt. Bring to the boil and allow to simmer for about 25 minutes or until nearly all the water has been absorbed. Remove from the heat, cover with a lid and allow to stand for 10 minutes. Then tip the rice onto a large flat clean tray. A metallic one is probably best as it will help the rice cool down quicker. Dress the rice with the mirin, turning frequently as this helps the rice to cool to room temperature. 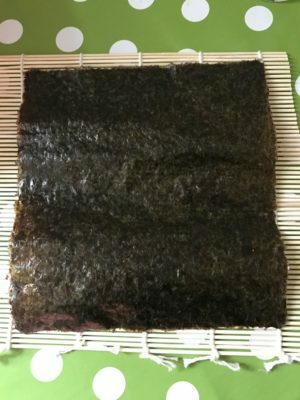 To make the sushi take a bamboo sushi mat and place a sheet of seaweed on top. Have a small bowl of water to hand. Dip your fingers in the water before you touch the rice. 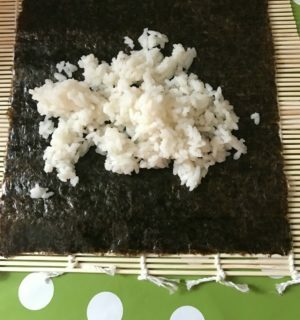 Spread the rice over three-quarters of the seaweed, take a little rice at a time and push it to the edges leaving a layer about ½ cm thick. Leave the quarter the furthest away from you plain. Trust me the water is definitely a good idea as the rice is very sticky. Once you have flattened the rice, it’s time to add your fillings. 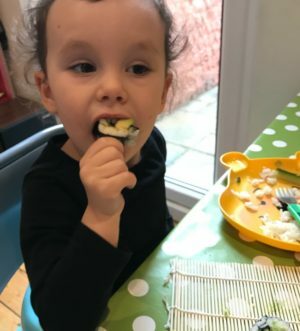 We went for long strips of cucumber and avocado as both are Clems favourite. 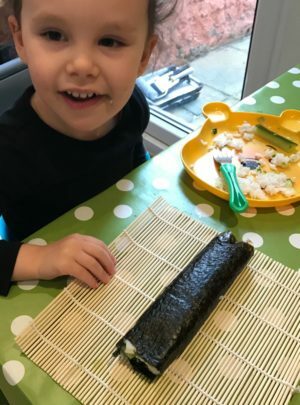 Roll up the bamboo mat slowly, tucking in the closer end of the sushi roll to start a roll and press lightly with both hands. 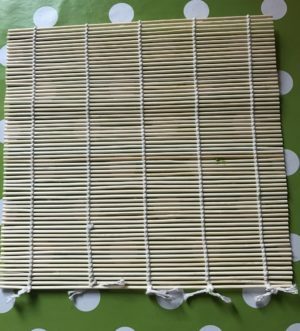 Remove the roll from the mat and leave to sit with the joining edges downwards. 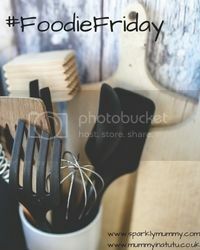 You can wrap in cling film and keep in a cool place until you are ready to serve. Don’t place in the fridge as this dries out the rice. Once rolled, using a lightly moistened sharp knife to trim the ends, cut into 6-8 pieces. Serve with pickled ginger and little bowls of soy sauce and wasabi. As you can see someone was very happy with the results. The first ones we attempted to make we didn’t use the nori on the outside as Clem isn’t a huge fan but these sort of just fell apart so the second lot we placed it on the outside. They still tasted super yummy though. oh well done you very clever!! And veggie too yum! sushi is one of my favourite things, however now being vegan I haven’t had it in a while. I will be trying out this recipe.